Nuarro Lodge, also known as Nuarro Beach Lodge, is a 'bush and beach' eco lodge on the gorgeous Baixo do Pinda Peninsula in northern Mozambique. 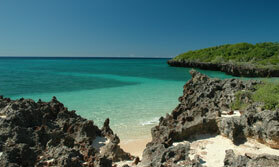 The bay is protected by a huge reef, giving fantastic swimming, snorkelling and diving opportunities. The lodge is on a 2½km long tropical beach surrounded by pristine bushland. Most people come here for deserted beaches, beautiful reefs, great snorkelling and diving, walks to waterfalls, and bird watching. However you can also enjoy visits to local villages. The local Macua village will welcome you into their lives to see how people live in rural Mozambique. Also, the coastline here is steeped in history and culture and trips can be taken to the nearby World Heritage site of Olha de Mozambique. There are 12 spacious beach front chalets spaced out along the dunes for privacy and minimum environmental impact. Sitting on your verandah simply looking out at the bay will probably be one of your favoured pastimes here before too long! There is an activity centre with dive school here, and Nuarro offers rental of diving gear, tanks, PADI courses and fully kitted dive boats with experienced instructors. Whale watching can be enjoyed in season (late June to late November) when humpback whales come close to the bay with their young. They can sometimes even be spotted from your bed! There is a small coral island off the beach which can provide an excellent viewpoint or take a dhow trip to get closer to them. This is a remote spot which you can enjoy in tranquillity with very few other guests. It's an unspoilt privileged piece of beautiful wilderness. Location: Baxio do Pinda Peninsula in northern Mozambique. Access is by flying into Nampula then either a 45 minute flight or a 3-4 hour drive to the lodge. Rooms: There are 12 beach front chalets spaced well apart, 10 of which have an upstairs area which can be used as twin beds for families. There are large king size beds and en-suite bathrooms with indoor and outdoor showers. Mosquito nets are provided. They also each have a large verandah with hammock and sun loungers. All chalets have charging points for batteries, cameras, tablets etc. Activities: Relaxation is the main activity, though you can go swimming, snorkelling, diving and kayaking. Stroll along the beach or use a bikes to explore further afield, and visit the local village, Nanatha, with or without a guide as you prefer. Dhow cruises, seasonal (July to December) whale watching boat trips and beach picnics can be arranged. The lodge has an activity centre, where staff are happy to help you plan your time. Facilities: There is a library and TV room. There is a seating area by reception and a shop selling local hand-made products. There is a sunken lounge off the restaurant. Dining: The restaurant has panoramic views over the bay. Fresh seafood and salads are a speciality. There is a beach bar selling snacks as well as beverages. Children: Children of all ages are welcome, though this tends to be more of a couples destination. Communication: There is internet access and Wi-Fi by reception and at the beach bar. Nuarro Lodge has a strong ethical and fair trade concept, managed and built by its owners to blend into the local environment and by local people with local materials. The land is co-owned with the local community. There are many local projects involving the community set up by the lodge including a community centre providing education, health clinic and agricultural projects. Powered by solar & wind energy, Nuarro aims to keep things natural. This includes their land, over half of which is untouched & protected.